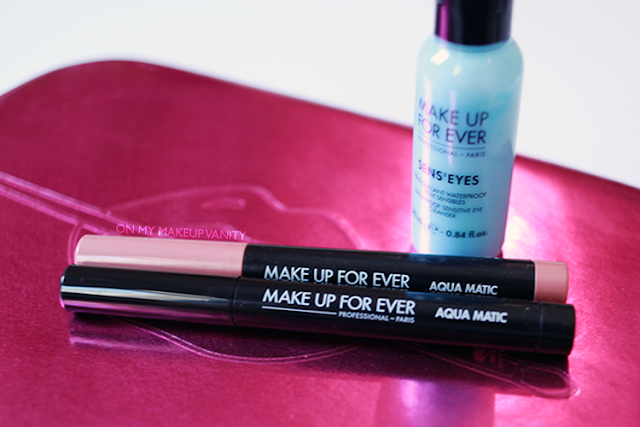 Today's post is a review about the new AQUA MATIC eyeshadow pencils from Makeup Forever (MUFE). I received 2 shades from MUFE Middle East a few weeks ago, and I've been testing them since, just to give a fair and honest review. *Please note that even though I sometimes receive some products to try, I try my best to keep my review and posts 100% honest. 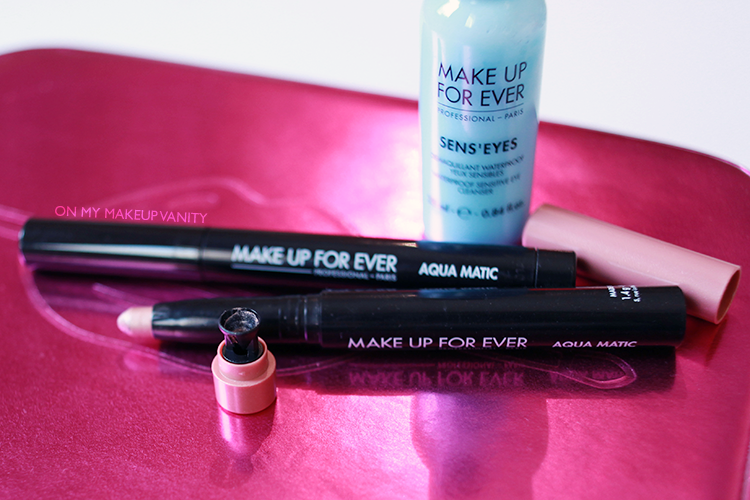 Makeup Forever did not ask me to write this post. The AUQA MATIC shadows are creamy eyeshadows that come in a pencil form. They are waterproof and come in 10 different shades ranging from matte to iridescent. The claim to be resistant to sea water, pool water, and rubbing (according to the press kit I recieved). The two shades I have are ME-54 and M-11 as you can see in the picture below, where ME stands for "metallic" and M stands for "matte". Since the shadows are waterproof, MUFE also sent me a sample of their SENS'EYES waterproof makeup remover (which works wonders, by the way). The shadow are twist-up kind of pencils. This is convenient for on-the-go application or for travel as you don't have to pack a sharpener with you. Each shadow pencil comes with a sharpener at the end which comes in handy if you want to have a precise application. I find that these shadows are very versatile. Yes, they are marketed as shadows, but I can get away with using them as eyeliners on my waterline as well. I like to use the light pink shade (ME-54) on my waterline for a bright everyday look. If you have sensitive eyes, I do not recommend doing that, though, because this shade has glitter in it (as it is a metallic finish). The glitter is so fine that it doesn't bother me. This shade is also pretty all over the lid with just a medium brown or a bronzer in the crease. Perfect for every day. 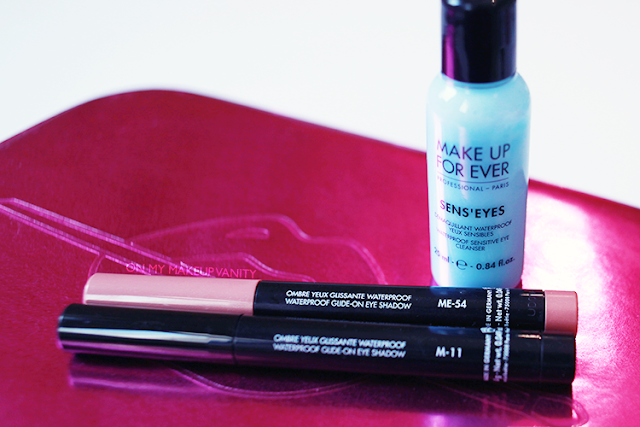 I also like to use the black shade (M-11) to create winged eyeliner. I use an angled brush or a tiny one to get the product off the tip of the pencil then apply it to my eyes. It stays put all day/night! 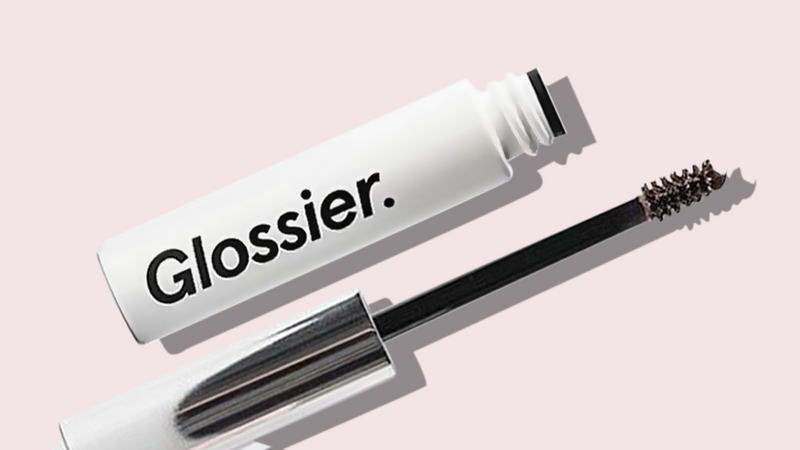 You can also line your waterline with it, since its matte, but if you have watery eyes then I don't know if this will suit you. If you are wondering what you can do with a creamy black eyeshadow, other than using is as a liner, use it as a base! Duo-chrome shadows/pigments/glitters look gorgeous on top! The one in the picture below is an Ingot one in the shade 71. It comes out opaque (much more opaque than without a dark base) blue and turns purple in certain lighting. 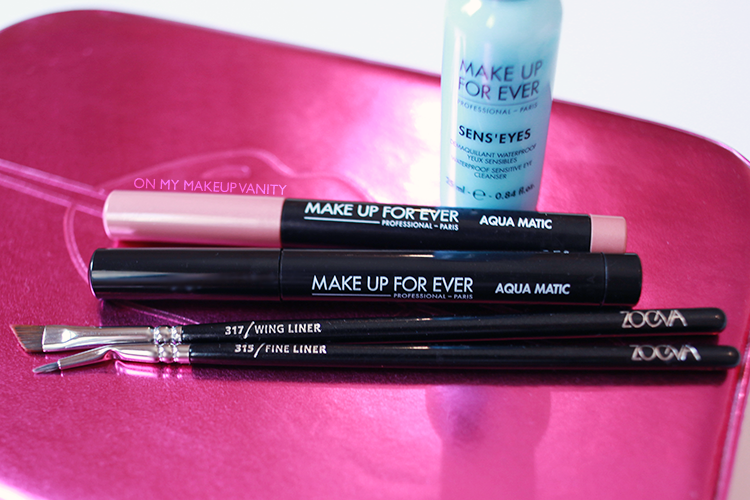 Finally, to sum up, here is my review after trying them..
♥ Waterproof indeed! I tried rubbing them under tap water but they did not budge. ♥ Long lasting. 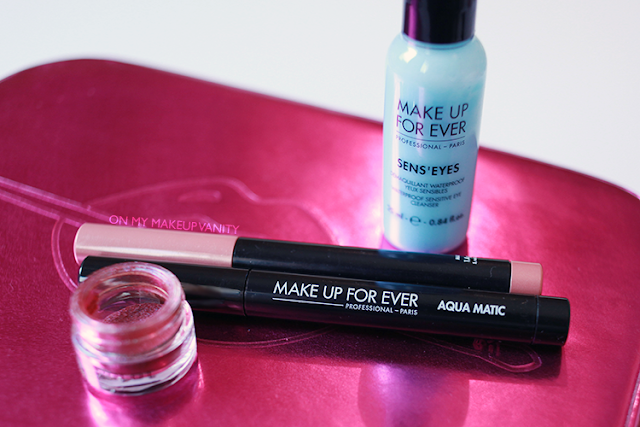 Use an oil-based makeup remover. ♥ Very creamy and easy to blend/smudge when they are first applied. ♥ They dry quickly so do one eye at a time. ♥ I noticed that I can smudge them (tested on the back of my hand - shortly after applying & drying) but I don't think anyone would apply that amount of pressure on their eyes so this is not really a bad thing.